If, for any reason, you are uncomfortable with your photograph being displayed on the Club's website, please inform a member of the committee. Please note that, for reasons of Health and Safety, names are not currently provided with any photograph. 02/11/2014 - Photos from the Laois Senior and Junior Cross Country Championships 2014 held in Stradbally. 27/04/2014 - Photos from the 41st Annual Student Games held at St Abban's AC track. 10/05/2013 - Photos from Day 1 of the Laois County Championships Track & Field held at St Abban's AC club grounds in Monavea. 06/05/2013 - Photos from the 18th Annual St Abban's AC Open Sports held at the club grounds in Monavea. 28/04/2013 - Photos from the 40th Student Games held in St Abban's sports grounds where Killeshin NS retained the cup. 06/01/2013 - Photos from the Laois Senior and Junior Cross Country Championships 2013 held in Tolerton. 26/12/2012 - Click here to view the photos from the St Stephen's Day Road Races in Tolerton. 06/04/2012 - Photos from the Good Friday run in Emo hosted by St Michael's AC. 22/04/2012 - Photos from the 39th Annual Student Games held at St Abban's AC track. 12/02/2012 - Photos from the National Indoor Championships held in the Odyssey, Belfast. 29/01/2012 - Photos from Day 1 of the 2012 Leinster Indoor Championships held in Nenagh. Photos from events in May 2011 which St Abban's AC athletes took part. 8th May 2011 - M3 Monavea Women's Mini Marathon held in Monavea - photos from the start, during the race and the finish of the race. The 38th Annual Student Games, Sunday 17th April 2011. Photos from the "National Club of the Year" celebration night held in St Abban's clubhouse on Friday 26th Nov 2010. On Sat 13th Nov 2010 St Abban's AC was awarded "National Club of the Year" at the AAI Awards night in the Crowne Plaza, Dublin. Click here to view photos from the night. Local Primary Schools Cross Country held in St Abban's club grounds Monavea on 15th Sept 2010. Click here to view the photos from the day. Recipeints of the Athletics Leinster Star Awards - 2010 which were held on 16th January 2010 in the 7 Oakes Hotel, Carlow. Our latest International Athletes were honoured on Tuesday July 14th 2009 at the clubhouse - well done to all. In early 2009, a number of club athletes made the trip to Magherfelt. The 2009 National School Table Quiz winners. Pictures from Ballyroan, January 4th, 2009 - taken by Terry Smeaton (thanks, Terry!). Day 2 of the 2008 Leinster Cross Country at Heywood College, Co. Laois. [Only a small collection as I was on traffic duty most of the day and missed a bunch of races]. Day 1 of the 2008 Leinster Cross Country at Avondale, Co. Wicklow. Uneven ages at Emo Court, Oct 19th 2008, Laois Credit Union's Cross County - State 2. Even ages at Emo Court, Oct 5th 2008, Laois Credit Union's Cross County - Stage 1. Photos from the 2008 Kids Summer Camp, August 2008 at the clubhouse. Some great photos from the Division 1 National League Final which took place in Tullamore at the end of July. Congratulations to the St. Abban's team in finishing a very credible 2nd. Well done! A large selection of photographs from the Juvenile Open Sports which took place on a glorious Bank Holiday Monday, May 5th, 2008 at the club grounds. Congratulations to our Carlow neighbours, St. Laurence O'Tooles Athletics Club, on winning the Monavea Shield. Some photos from the Laois Credit Unions County Track and Field Championships, May 2008. Note that as the light faded, my camera tried to compensate. Consequently, some of the pictures are in black'n'white. A group of 12-15 year-old athletes took part in the Cool Food Dude "Healthy Eating" training course held recently at the club. Here's a few snaps of our budding celebrity chefs! Thanks, again, to Michael Daly for these pictures. The 2008 National Schools Table Quiz produced on the of the closest contests in years. Here's some photographs from the final (thanks to Michael Daly). A small set of pictures from the Leinster Indoors at Nenagh, February 2nd, 2008. Note: the lighting system was poor, and a lot of my pictures came out quite fuzzy ... these are the ones I managed to salvage. Michael Daly took some pictures at this year's trip to the Belfast Odyssey - Jan 25/26, 2008. A small selection of photographs from the Leinster Juvenile Cross Country Championships at Tinryland, Carlow, January 20th, 2008. Our 2007 Leinster Cross Country Athletes were honoured at the club on Friday 23rd November 2007. Well done to all! A fine November morning produced a great days athletics at Heywood College, Co. Laois for the Uneven Ages Leinster Cross Country Championships. Some great pictures from the Laois Credit Unions Cross Country Championships held in Emo Court, Sunday 14th October 2007. Summer Activity Camp 2007 - a small selection of photos from the first day. And here's some more pictures (from the last day) showing some of the new friends made at this year's camp. Three photos from Round 2 of the ESB National League, Cork IT, July 29th 2007. The presentation to the Laois athletes that will represent their county at the Schools Internationals in Wales on July 21st, 2007. These pictures were taken on July 18th, 2007 and include a presentation to Barry Pender following his attendance at the World Youth Championships at Ostrava, Czech Republic. A good collection of photos from the Laois Senior Championships and J.K. Malone Trophy, July 18th, 2007 at Monavea. A few images from the All-Ireland U10-U12 Finals at The Mardyke, Cork, June 24th 2007. The Laois Credit Union County Championships, Sunday May 13th 2007 at the St. Abban's Sports Complex. The 34th Annual Student Games, Sunday 29th April 2007. Some familiar faces can be spotted taking part in the Meath Athletics/AAI 10Km Championships at Navan. Note: this is an external link. The Annual National School Table Quiz - 2007 - kindly sponsored by Dineen Refractories. Thanks, again, to Michael Daly for providing these pictures. Some athlete portraits. Thanks to Noeleen for these great pictures. A big thank-you to Penturf Ltd. for sponsoring the club's purchase of a defibrillator. A great turn-out (and a fine group photo) show their appreciation to Penturf. March 20th 2007 - The Club hosts a reception in honour of Stephen Attride's selection to represent his country in the upcoming Schools Cross Country internationals. A great crowd made this a great evening for all. March 2007: Pat Ryan, Regional Devlopment Officer with the Athletic Association of Ireland, presents the club with a Junior Equipment Pack in regognition of a number of club members attending a recent AAI training course. The kids had fun checking out the new stuff (as did the adults!!!). The trip to the Belfast Odyssey Arena produced some great performances from St. Abban's Athletes - here is a large selection of photographs from the event taken by Michael Daly. A small selection of the medal winners at the Nenagh indoors, January 2007. [Thanks to Michael Daly for these photos]. The January 2007 Novice and Vets Road Races, Portarlington, Co. Laois. Thanks are again due to Terry Smeaton for providing these images. A collection of photots from the Cross Country season, Autumn 2006. Thanks to Noeleen for these photos. The 2006 Leinster Star Awards, January 6th January 2007. The 2006 St. Stephen's Day Road Race. Once again, thanks are due to Terry Smeaton for kindly providing the vast majority of these images. The Seniors Laois Cross Country Championships at Ballyroan, December 3rd, 2006. These photographs were kindly supplied by Terry Smeaton. The Laois Cross Country Championships and Relays at Ballyroan, December 3rd, 2006. Here is a picture which was taken the last time the Ballyroan venue was used to host a cross country athletics event. The event? 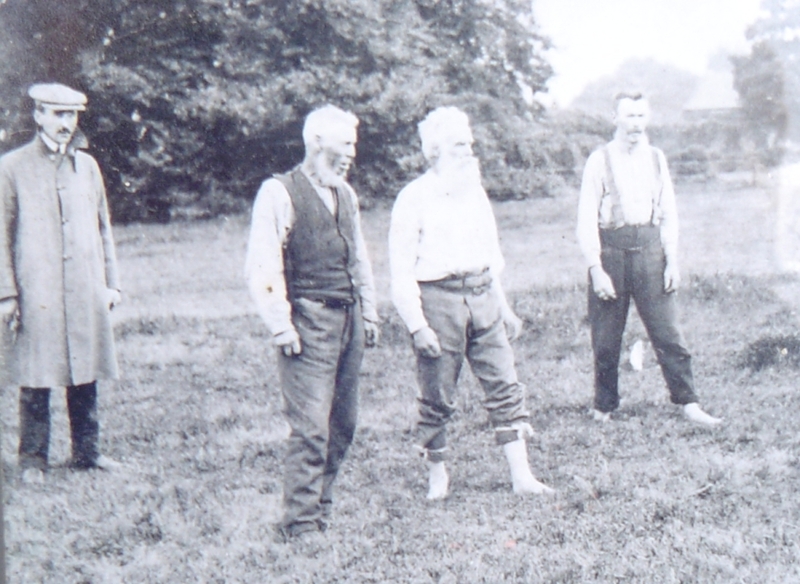 The old-age pensioners race (the picture is of the three winners and an official). The year? 1910. The Laois Cross Country Championships at Clonreher - Teams Events took place at St. Abban's. 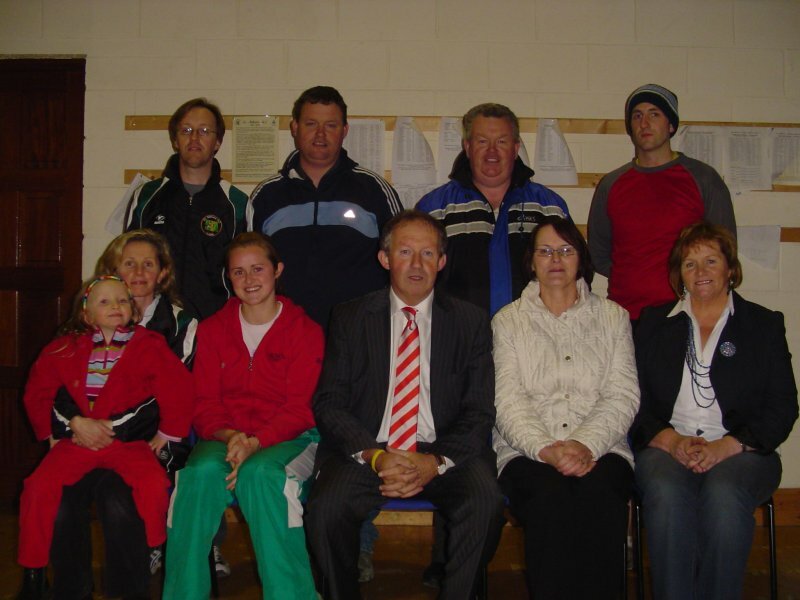 Minister of State, Tom Parlon, TD, visited St. Abban's on October 26th, 2006 to dicuss the club's future development plans. The Laois County Council Civic Reception, October 18th, 2006. Here's some more photos taken by Noeleen. The Laois Cross Country Championships at Emo Court, October 15th 2006. The Laois Cross Country Championships at Clonreher, Ballyfin, October 1st 2006. The Tolerton 10K (mens), 5K (ladies) and 10K walk for 2006 - 40 years on the run! A small collection from Julieann Cantwell's going away dinner. The U.14 - U.19 Championships in Tullamore, July 15th-16th 2006. Photos from the 50th Anniversary Book Launch, July 3rd, 2006 - Monavea. The National Star Awards 2006 at the Arklow Bay Hotel. Pictures from the Laois Credit Unions sponsored Track & Field Championships of Laois, Sunday May 14th, 2006 - Monavea. 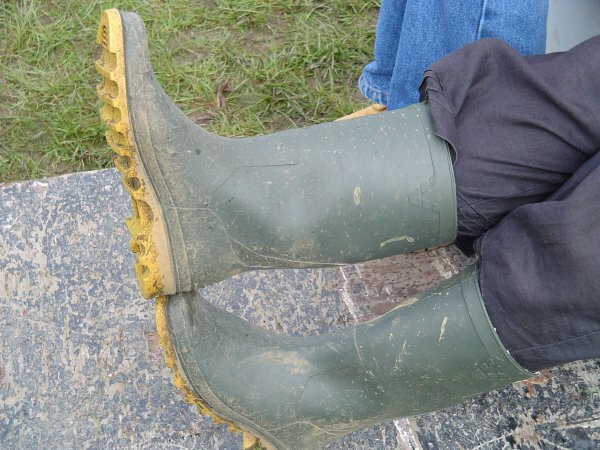 Can anybody identify these boots?!? The 33rd Annual Student Games, May 7th 2006, at St. Abban's. Results are now available. The Open Sports for 2006. The 60th Birthday Celebrations at this year's Student Games. The National Schools Table Quiz 2006 - Winners. A few photos from this year's Dinner Dance (2006). The Nenagh 2006 - Medal Winners - March 2006. Leinster Cross Country Relays in Alsaa Dublin, January 29th, 2006. Well done to the Girls u12 team in the 4 x 250m event - gold medal winners! The Leinster Relays, held at Nenagh, 2006. Here are photos of the individual medal winners at Nenagh. The Leinster Indoor Championships, Nenagh, Stage 1 - January 2006. The club's Trustees (taken January 7th, 2006). The Leinster Star Awards Dinner, Seven Oaks Hotel, 7th January 2006. The St. Stephen's Day Roadrace, 26th December 2005. The Ballyroan Cross Country event, autumn 2005. 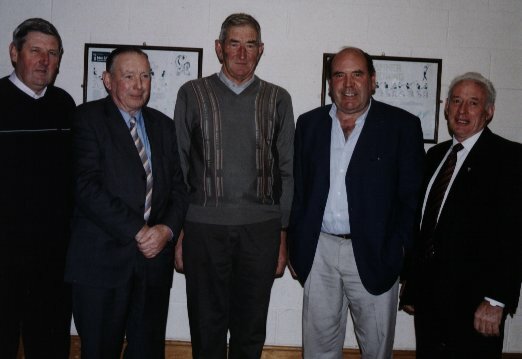 The Senior Men and Committee Members, 2005.